Having recently completed a Home Preserves Course (and passed with a distinction) I wanted to share my top marks recipe with you. My palette is tantalised with a real sweet sour vibe and this just fits the bill. Also by using cider vinegar it makes it Gluten Free. Hope you enjoy it. Put the spice bag spices in some muslin, tie it up and put it in the preserving pan with all the other ingredients except the sugar. Slowly bring to the boil, reduce the heat to a simmer, when the onions are soft add in the sugar, stir until the sugar has dissolved. Simmer slowly for 2 ½ - 3 hours, until its thickened and well reduced. To check its ready, draw a flat edge wooden spoon along the bottom to expose the bottom of the pan, if no thin juices fill the void its ready. Sterilise your jars & lids by putting them on a tray in a hot oven. 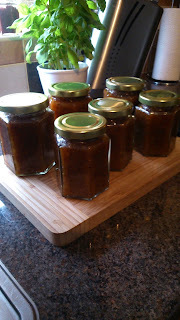 Fill the warm jars with the hot chutney (don’t fill them right to the top leave about 1cm void) Place the lids on tightly, label when cold, store for at least 6-8 weeks before eating.